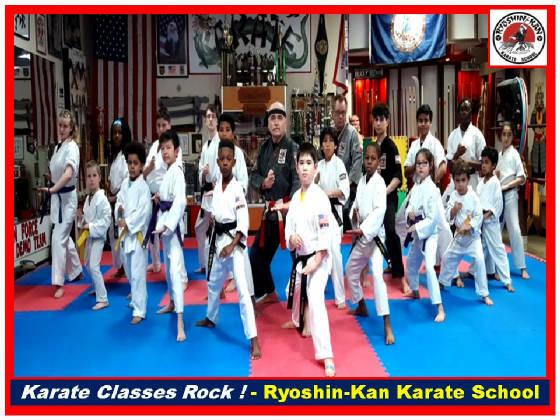 "Best Karate School in Virginia Beach, VA."
All Students are Number One at the Ryoshin-Kan Karate School. We Offer the Best Adult and Youth Martial Arts Programs in Virginia Beach, Virginia. Discounts to All Military, Family, Students & more. Come on in and Join us for an Awesome Karate Adventure! Action Packed & Fun Filled! 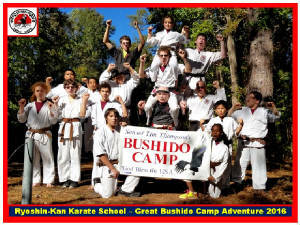 Ryoshin-Kan Karate School offers Karate Camp Adventures in the Winter, Spring, Summer & Fall. 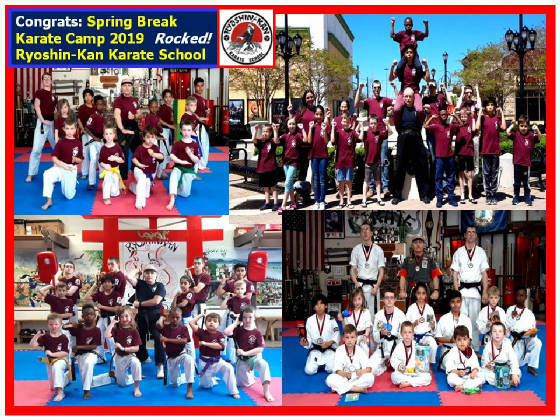 Click Here to Visit the Karate Camp Page! 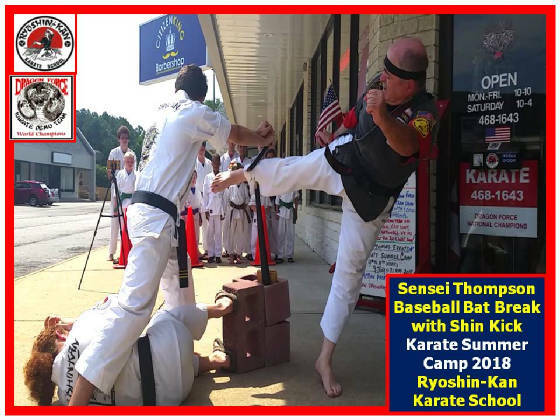 Congrats: Great Dragon Force Karate Demo & Hanshi Thompson Seminar! Sparring & Self-Defense Classes Rock! Karate Classes are Action Packed & Fun Filled! Please Click on the Photo to make a Donation! 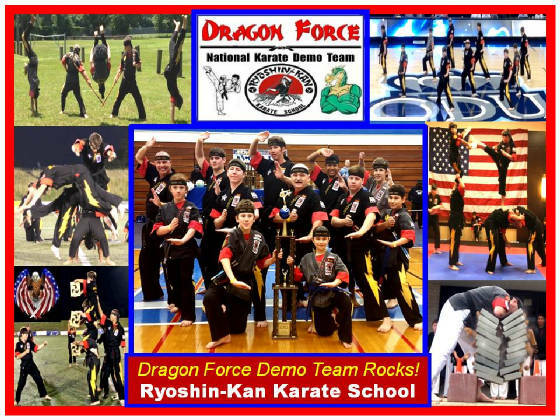 *Supports the Dragon Force National Karate Demo Team & Ryoshin-Kan Karate School. *Donations will be used to help pay for New Uniforms, Gear, Dojo Fees, & Overhead cost. "To be a Karate Champion you have to train with a Karate Champion." "Best Karate Classes in Virginia Beach, VA."
"Best Karate Class in Virginia Beach !" Day, Night & Weekend classes. 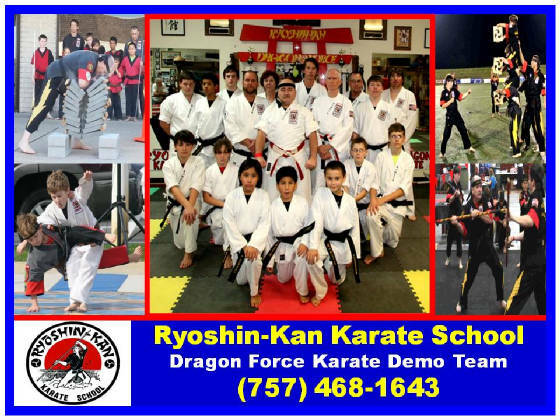 The goals of the Ryoshin-Kan Karate School / Dragon Force Karate Demo Team are to be the best at what ever we do and to promote the Martial Arts principles of Honor, Respect, Loyalty, Discipline, Patience, Endeavor and Commitment. Send us an e-mail with the correct answers and win discounts / coupons plus Free Karate classes. Hint: Click on the photo to find your answer. 10 X National Black Belt Self-Defense Champions and 5 X Hall of Fame. 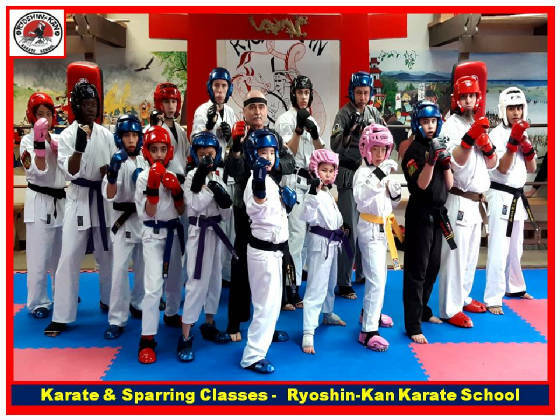 Members are hand-selected and represent the "Best of the Best" in the Ryoshin-Kan Karate School. 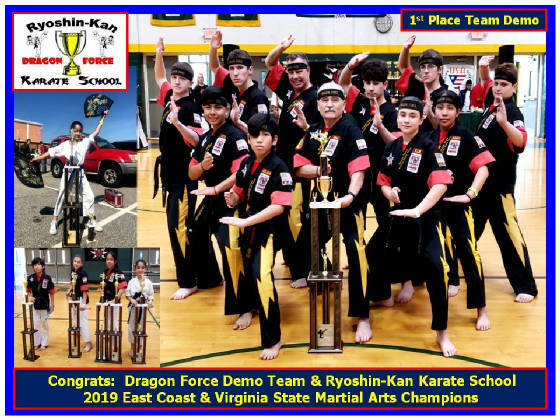 What we do: The Dragon Force Karate Demo Team are ambassadors of the Ryoshin-Kan Karate School in Virginia Beach , Virginia. We perform at various community and social events to bring awareness to the benefits of a structured martial arts program. The Dragon Force Karate Demo Team and the Ryoshin-Kan Karate School were established by their Founder / Director, Shihan Tim Thompson in 1980. 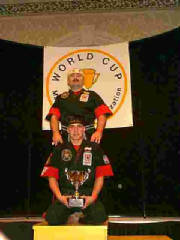 The Dragon Force National Karate Team was Officially established by Shihan Tim Thompson in 1995. 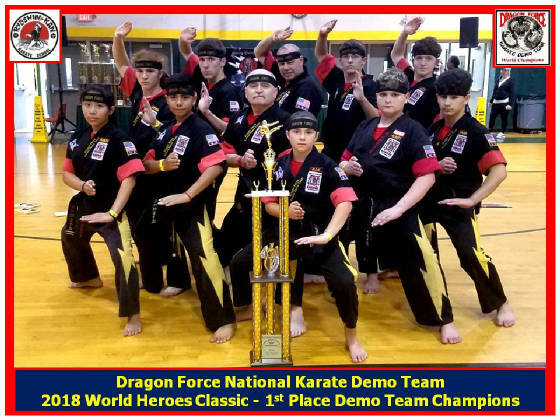 The Dragon Force National Team performs Karate Shows and competes at National Championships. Members of the Dragon Force National Team are selected from the star performers of the main Dragon Force Karate Demo Team. 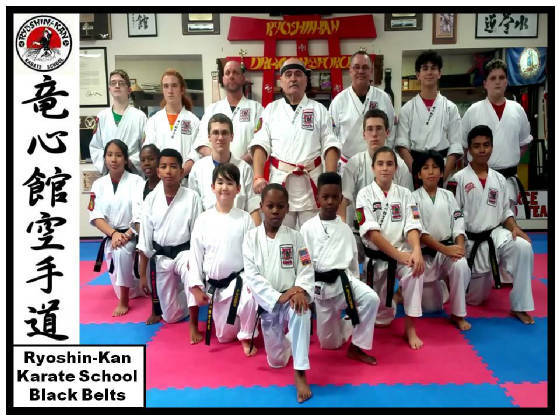 From 1980 to 1995 Ryoshin-Kan Karate School Won numerous 1st Place Trophies in Various Divisions. 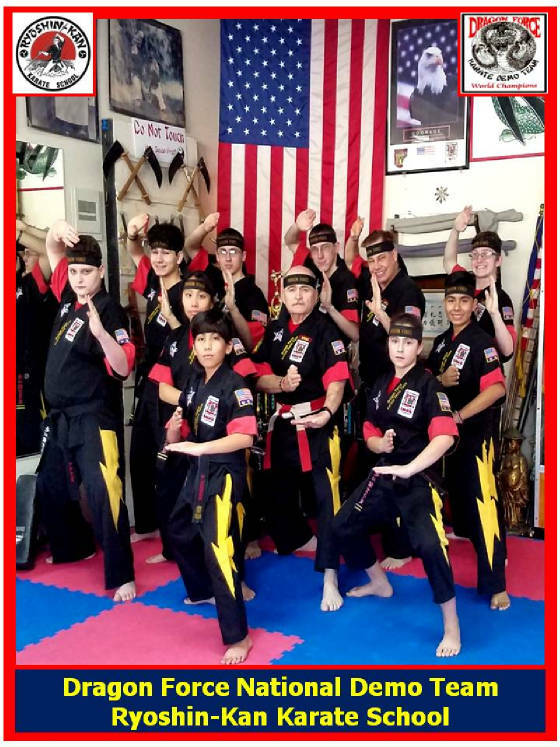 Since the Creation of the Dragon Force National Karate Team in 1995, Shihan Tim Thompson's outstanding Dragon Force National Team has won 1st Place Trophies at 18 National / World Championships in 1996, 1999, 2000 thru 2019. Dragon Force has won the World Cup Team Grand Champion Nine times and they are the First Demo Team to Win the World Cup Martial Arts Championships three years in a Row! Go...Go Dragon Force ! Shihan Tim Thompson and the Dragon Force Demo Team are available to do Karate Shows and Seminars at your event. He is available to conduct Seminars, Clinics and Private Lessons in Karate, Kobudo (weapons), Goshinjitsu, Kenjitsu, Tameshiwari, Team Kata / Pairs, Demo Team and more. Learn form the Best and participate in one of our Excellent Karate Seminars, Clinics or Classes. Visit our Sponsor and contact page for more information and to schedule a seminar or demo. You can also call us (757) 468-1643. SPONSORSHIP PROGRAM: Find out more about our sponsorship programs and a list of our Current Official Dragon Force Sponsors by visiting our sponsor / contact page. If you would like more information about Martial Arts Classes / Seminars, Camps, Dragon Force Karate Shows, sponsorships, etc... visit our contact page. 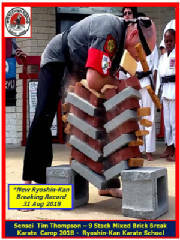 Click to visit the KARATE NEWS PAGE. 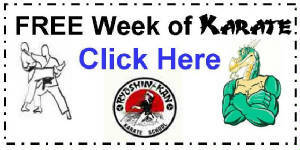 Check out the Karate News page for the latest updates, tournament results and Upcoming Events. VISIT OUR NEWS PAGE ! 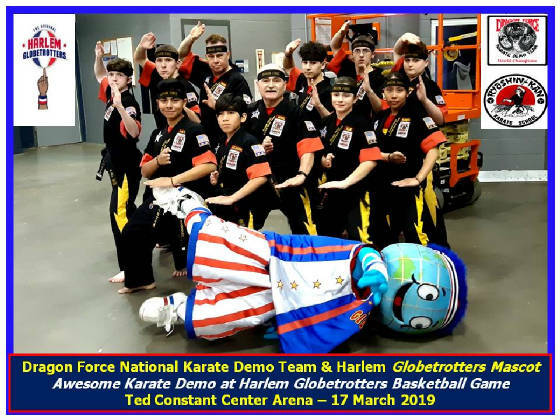 Team Dragon Force Rocks Globetrotters Show: Congrats to Dragon Force Demo Team on performing an awesome Karate Demo during the Harlem Globetrotters Basketball show at the Ted Constant Center Arena in front of 9 Thousand cheering Spectators on 17 March 2019. 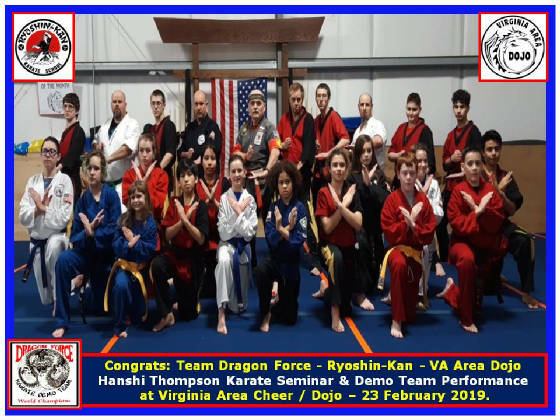 Great Dragon Force Demo & Karate Seminar: Congrats to Team Dragon Force, Ryoshin-Kan Karate School & Va Area Dojo on a great Dragon Force Demo & Hanshi Thompson Karate Seminar at Va. Area Dojo on 23 Feb 2019. Well Done! 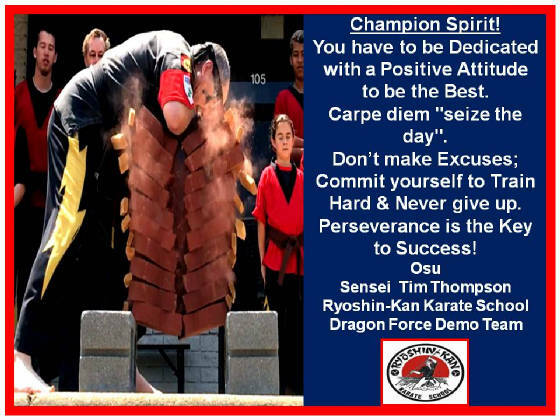 April - Self-Defense Class Every WED - Ryoshin-Kan Karate School - VA. Beach, VA.
April - Breaking & Self-Defense Clinics - Saturdays and Sundays - Ryoshin-Kan Karate School - VA. Beach, VA.
Hanshi Thompson's Martial Arts Seminars- U.S.A.
"You have seen the Rest, Now Train with the Best!" "The Best Defense is Self-Defense." The Best Martial Arts Instruction and Classes for Adult and Children in the Virginia Beach, Virginia Area. at the Ryoshin-Kan Karate School.